My colleague, Melvin, called me a traitor this week for drinking tea. I disagreed, it was a detox regime in preparation for the next wave of coffee tasting. I learnt this is necessary the hard way. My internal cells just do not cooperate the way I want them to i.e., both Uma and her cells are like two separate entities requiring constant counselling on many lessons related to human existence. Early this month, I finally made that trip to Kampar and Ipoh, the plan that Poh Lin had to dig out of the ancient archives. This was not my first trip there though. My father's job required him to move to various places in the country during my schooling years. This gave me the opportunity to experience each state's culture a tad more than just being a happy tourist. Ipoh was one such place. This recent trip, however, was the first for just a cup of coffee. I booked myself on the earliest ETS train out on Saturday, Poh Lin joined me at her stop in Kampar. I have known Poh Lin for a while now, she once worked in Cyberjaya and was my travel companion on that schedule-less RapidKL bus to work. Up until recently, I had her listed as ‘Pauline from the train’ in my contact list. Ipoh is the administrative capital of Perak, 200km north of Kuala Lumpur. In the late 19th century, Perak was regarded as one of the more economically wealthy states due to mining opportunities. 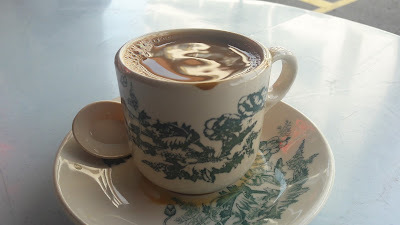 This brought in many Chinese immigrants who brought along with them the famous ‘kopi’ from China. Today many of these local mines have been forced to close due to the collapse of the global tin industry. However, the presence of the local coffee remains strong. We visited the famous Jalan Bandar Timah in the old town district. I was overwhelmed to see a countless number of Hainanese styled coffee restaurants, each carrying its own brand of packaged coffees. We visited two of them. First Nam Chou who is also famous for its Curried Noodles. According to Poh Lin, Nam Chou serves good hot local coffee. So that’s what I had. I liked it, it’s an excellent wake-me-up coffee, stronger than the local coffees that I am used to in KL. The next was one of those life-saver coffees which are my antidote for stress. 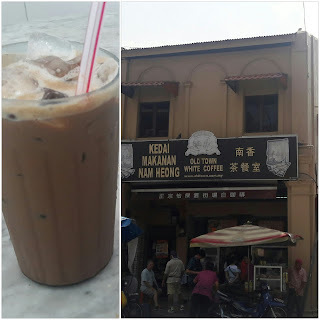 Many of us know this as the Old Town White Coffee. Nam Heong is where it all started. According to google search, Nam Heong has been in existence since 1958. It was almost noon, and we were in an overcrowded restaurant on a sweltering day. Yet, we managed to share a table with a friendly family before moving to a smaller one for two. The cold ice-coffee was refreshing. I also found it strong, perhaps just as strong as Nam Chou's. My decision to have fried Char Koew Teow (the vegetarian version) was probably not a wise one. I did not feel like myself when the overdose of strong coffee and noodles kicked in. The beans used and the way the beans are roasted there contributes to the uniqueness of Ipoh coffee. Some add sugar and margarine to the roast to give it a distinct flavour. My close friend, a local Ipoh-an - Chong agreed to show me places where they roast these beans. That’s in Ipoh 2.0 and I am looking forward to it. My grand plan of trying various coffees was short-lived due to natural body defences. After just two cups of local beverages, I surrendered to lime, ginger and barley juices to detox that day and had regularly been detoxing ever since. Again, listen to your body, it knows what’s best. Will do so Melvin. There is Ipoh 2.0 in the plan.